As if to herald the first official day of spring, the first Hungarian Bread Seed Poppy bloomed this morning! I planted these from seed back in the autumn (along with parsley, lettuces, scallions, snap peas, and other winter veggies) in the raised planter bed I relocated to the front garden. The lettuce has all been harvested and so have the scallions. The Italian flat leaf parsley called "Gigante" is living up to its name on one end of the bed. And up against parsley, these poppies have been growing, and growing, and GROWING! The plants are huge! But there haven't been any signs of buds all winter (even though most Oriental and Iceland poppies are a winter flower around here). I was very anxious to see what the poppy would look like because I've never grown these before. 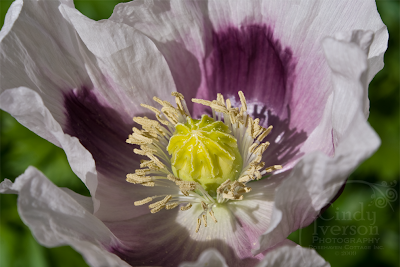 I had no idea there would be such a rich purple in the center of this large poppy blossom. And so, instead of being the winter-bloomer I had planned, the Hungarian Bread Seed Poppy has joined the rest of the lovely blooms in the Rosehaven Cottage gardens to welcome the first day of spring! I would love to browse your garden! Gorgeous poppy. Lovely hyacinths and lilacs. What a feeling to get outdoors and find such beauties in the garden. The poppy is so pretty, and kind of exotic-looking! Hi, I have just found your blog ( I was blog hopping!) it's so lovely that I have decided to follow it. I look forward to popping back when I have some time and really looking through it. I have a poppy plant. And just today I was wondering what kind of bloom it would have. I love that! What a lovely poppy Cindy! And how sweet that you caught it as it was waking up...the color is beautiful and I like that it looks like little ruffles on top. That is one amazing poppy and what a detailed picture ! Gorgeous colors in that poppy - what a perfect Spring welcome. I think that is the prettiest poppy I've ever seen! Love that color! Just beautiful, Cindy... I love the color of this poppy. Cindy, that is just beautiful! I've never grown them before either and I have seeds. I will sow them this weekend, once I decide just where I want them to go. I hope I get some blooms as beautiful as that one! Cindy, I can't get the poppy to show up. It sounds so gorgeous, and I hope that it will show up soon. There she is, and even more beautiful than I would have thought. Would you if you ever get some seed, please send me just a pinch? What a beautiful fragile looking bloom. I do love poppies. :-) My favs are the fancier ruffled lookiing ones in so many different colours. Cindy, I love poppies and that one is a beauty!! Thanks for sharing! Budding flowers are like surprise packages from Mother Nature, aren't they? Pretty. I love your Spring surprise!